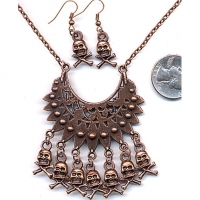 $12/DZ NECKLACE AND EARRING SET. 20" CHAIN NECKLACE , ALL THIS DARK COPPER COLOR, THIS IS THTHE OTHER SIDE OF THE ITEM WITH SAME NUMBER, BUT DIFFERENT ENDING., COMES CARDED AND RACKABLE. QUARTER IS FOR SIZE SCALE.